With the latest employment data bringing 2013 to an end, I wanted to take stock of where the state is in recovery and relative to pre-recession levels. Today we take a look at the regions within Oregon and how they have fared so far. Tomorrow will be a similar look, but at the industries within the state. The graph below shows both the depth of recessionary losses and also where these stand today. I allowed the pre-recession peak to vary as we know, for example, many of our southern counties experienced job losses earlier than our northern counties. This is designed to capture the true depth of each region’s Great Recession and also where in recovery each of these areas is today. Only the Columbia Gorge has regained all of its recessionary losses, although the Portland Metro is very close. In terms of largest improvement, Central Oregon has made up the most lost ground, however the regional losses were the largest across the state. Click on the regional tab at the top of the page for more on each region within the state. The good news is that all of our regions have some at least some improvement from the depths of the recession, however many have not grown much. Overall this pattern still fits within our housing and government story in terms of local economies. As these two industries improve — which are larger shares of more rural economies — total employment in these regions will pick up as the expansion continues. Outside of the Gorge and Northeast Oregon, which followed different paths than the major macroeconomic trends in recent years for various reasons, the turnaround happened first in our major metro area — Portland — and has now spread to our small and medium sized metros. As these continue to recover, economic growth is expected to continue to spread to our rural counties. 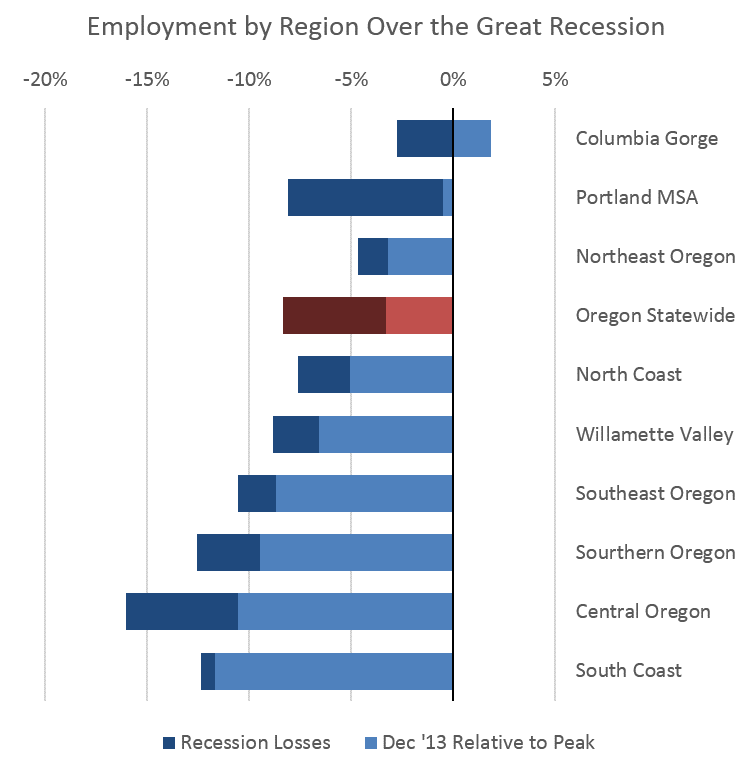 Tomorrow we take a similar look at industries within Oregon and how these have fared both in recession and recovery.